OMG, it's almost Spring! The newsstands are filled with glossy spring fashion issues and my heart is filled with joy. 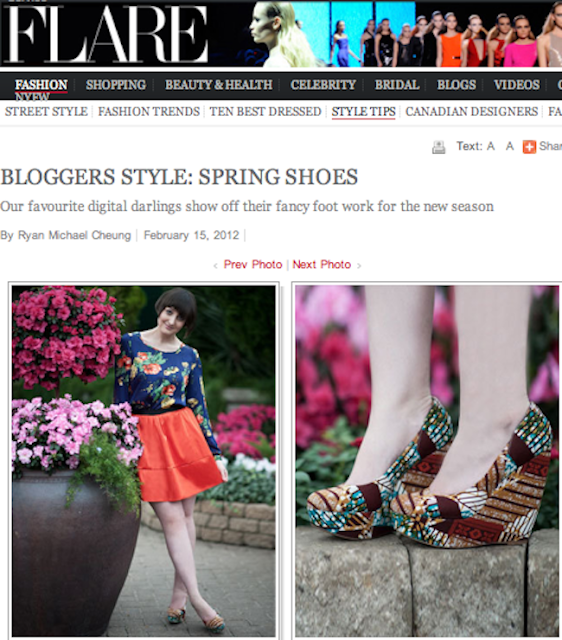 Big thanks to Flare.com for featuring Canada's most fashionable bloggers, including Dress Me Dearly, in its Spring Shoes feature. Your favourite Edmonton bloggers including Adventures in Fashion and Kastles were also featured! Check out the full gallery here! Shirt, F21. Skirt, H&M. Shoes, Aldo. Photos: Harvey Miedreich. Oh how exciting! I love those shoes, and remember the post when you got them! I love the way you've styled this outfit! Congratulations on all this success! This is so exciting! Is that the Mutart Conservatory? Stunnnnnning.